Although brake lubricant is often an inexpensive item used with the brake replacement process, it is integral to how the system operates. Some copper-based substances can have a negative effect on a vehicle’s brakes, and it’s important for mechanics to understand these pitfalls. Scott Irwin, Technical Manager at premium aftermarket brake brand, Mintex, discusses the issues associated with certain lubricants, and how mechanics can ensure that they’re using the best grease for the job. Most garage professionals will agree the brake replacement process takes time and there is nothing worse than a customer returning with a noise or judder complaint. Even when meticulous steps have been taken to clean down the system correctly, while conducting all the necessary checks, sometimes the brakes still do not perform quite right. But, why? The answer could lie in the type of lubricant being used within the system or the condition of the grease. When visiting garages, it’s not uncommon to see a tin of copper slip sitting open on a mechanic’s bench, exposed to the elements. Should contamination from airborne dirt and moisture occur, the lubricant will become ineffective causing problems for the brakes. The best way to avoid these issues and ensure that you’re using a grease that complements a vehicle’s brakes is to choose a copper-free product. There are several disadvantages of using a copper-based substance within a braking system, which should be enough to discourage mechanics from using them altogether. Firstly, products such as copper slip cannot withstand high temperatures. This is an issue as it stops the pads from moving freely within the system, in turn causing drag and premature ware. It can react with steel and aluminium, increasing corrosion between these two metals should contact occur. If you’ve ever had to knock the wheel off from the hub and wonder why, corrosion due to a copper-based lubricant could be the reason. A third issue with copper grease is the effect it can have on a vehicle’s ABS, ESP and EPB systems. As brakes are becoming more sophisticated, this is an important issue, as year-on-year more electronics are being added to the methods behind how vehicles brake safely. As copper is conductive, the presence of the metal in the braking system can interfere with the magnetic sensors found within a car’s ABS and electronics. If this was to occur, it could cause the ABS to malfunction, which could lead to issues with warning lights, or potential wheel locking. Not only this, but copper lubricants can increase the likelihood of excessive run out when smeared on the surface of a hub, as they can contain foreign bodies such as metal particles when left open on the bench, as previously mentioned. The maximum run out should be 00.07MM and this should always be tested with a DTI gauge before completing the brake replacement. Copper-based greases are also unfriendly to the environment as the metal cannot breakdown efficiently, causing contamination to soils, plants and animals. 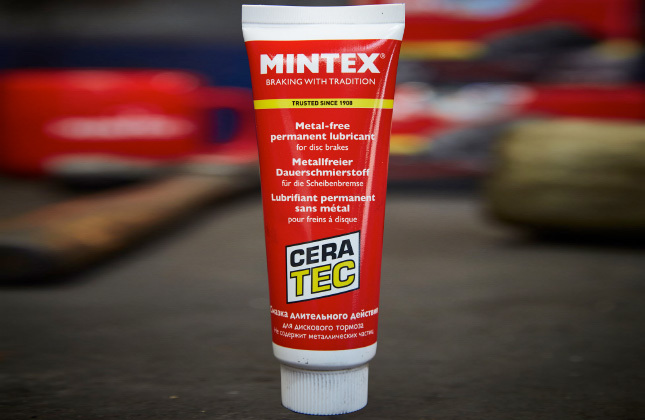 While it’s clear that the use of copper-based greases can cause problems for mechanics, there are an array of lubricants that do not include metal particles, such as Ceratec. The advantages of using this grease are abundant, with the first being that it can withstand the braking system’s high temperatures. This, unlike copper-based lubricants, allows the pads to move freely, eliminating issues such as drag and wear. It can also be used where electronics are utilised within a vehicle as it is non-conductive and does not contain metal particles. As well as being more suited to how a braking system operates, the product is user-friendly and versatile. One tube can cater to approximately 35 sets of pads and it also protects against scratching and corrosion. Albeit a seemingly trusted partner to the seasoned mechanic, copper slip can cause problems for modern-day braking systems. Once a go-to product, times have changed, along with technological advances that vehicles have made in recent decades. Today, it’s safe to say that garage professionals are extremely busy, and cannot afford for vehicles to come back with complaints. With this in mind, surely it’s best to eliminate extra work at every possible opportunity, by taking care of the small stuff that will ultimately make the biggest difference. With more than 100 years’ experience, Mintex provides a complete premium aftermarket braking solution for millions of cars across the world. For more information, or advice from the Mintex technical team, contact uk.technical@tmdfriction.com.